Heavenly Valley mountain resort is hot for summer. Water sports dominate with jet skiing, wake boarding, water skiing, and just cruising the lake. Fishing is great in the local streams. The mountain resort in South Lake Tahoe opens the ski resort hill for one of the toughest mountain terrain parks in the region. The Sky Chair and zip line are also hugely popular. We recommend you make your reservations ahead of time as they sell out. South Lake Tahoe is filled with shopping, restaurants, and just good old time fun. The larger Nevada hotels in Stateline have casinos and headliner entertainment so nightlife goes... all night. 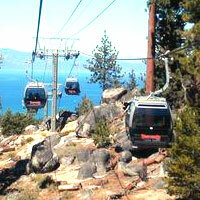 Vacationers fly in from all over to live it up in Lake Tahoe. One of the most popular day trips is the drive around the lake and stopping at all the scenic spots including Vikingsholm, Emerald Bay and a walk on the boardwalk in the north. If you're planning on visiting Heavenly Valley you will want to make your reservations sooner rather than later. The lakefront Heavenly Valley Lodging goes first. These are the nice rental homes that have private beaches, or are a short walk to the shore or downtown. Many will have minimum night stays for the summer somewhere around 6 or 7 nights, so when you search, try different arrival dates. During summer, Harrah's and Harvey's put on outdoor concerts. Staying right at the venue can make the walk to the outdoor stadium simple... and hey, no parking either! They also offer a lot of value for the money. The complete list of Heavenly Valley Hotels available with instant reservations makes it easy to compare the features of each. There are a lot of them, so you may want to decide if you would rather stay in Stateline where the casinos are or in one of the hotels on the California side in the city of South Lake Tahoe, many which are smaller with less amenities, but could have a feature such as a private beach or pool overlooking the lake. br> Whether you take a Tahoe vacation rental a South Lake Tahoe Heavenly Valley Hotel, your Tahoe vacation will be a memorable holiday. Welcome to Lake Tahoe!